The island has been calling to you all week. You first noticed it from La Pointe des Châteaux, a rocky peninsula that forms the eastern tip of Guadeloupe. It stayed on your mind as you explored Saint-François, Le Moule, and the rest of Grande-Terre. It seemed like fate when you found the ferry’s departure point. La Désirade, here you come. La Désirade (the Forgotten) is just five miles and a 45-minute ferry ride from Saint-François, but it’s the least developed and least visited of Guadeloupe’s five islands. 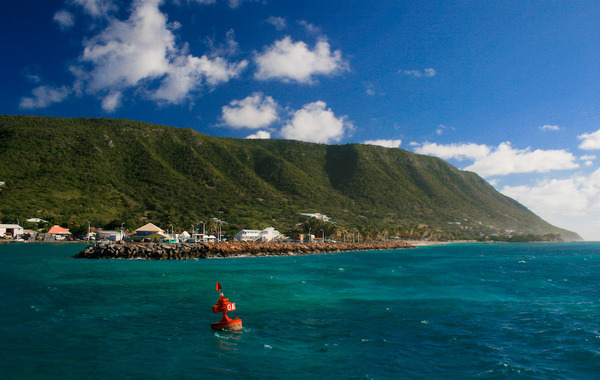 The seven-mile-long island is actually the oldest island in the Lesser Antilles, a chain that stretches from St. Kitts to Trinidad on the eastern edge of the Caribbean Sea. It’s been home to the Amerindians, pirates, and a leper colony over the centuries. Today, less than 2,000 people live along the slopes of La Désirade’s steep plateau. After the ferry slowly moves through the long, protective coral reef, you arrive in Beauséjour, the main settlement, to find colorful buildings and small fishing boats. The church is famous for its altar carved out of pear wood. The cemetery is decorated with conch shells. While a single road links the western side of the island to La Désirade National Nature Reserve, where you’ll find cacti and large Lesser Antillean iguanas, on the east end. It’s a quick drive, on a scooter, from one end of La Désirade to the other, but don’t rush. There are plenty of stops to make along the way. Visit the ruins of the French internment camp south of Beauséjour, and the ruins of the leprosarium and an old cotton mill outside of Baie-Mahault. Hike to see a small white chapel, the nearby Petite Terre Islands, and a panoramic view of the sea from Grande Montagne, the top of the plateau. Go scuba diving in the shark cave, where you’ll find barracudas, manta rays, and, of course, sharks. Test out all the beaches—including Anse Petite Rivière and Anse d’Echelle—before deciding that Plage du Souffleur, one of the longest stretches of sand on the island, is your favorite. Then find a little beach restaurant, serving fish fritters and grilled shrimp, with tables in the sand. Let’s hope this island stays forgotten.